Hmmm, our semolina is golden yellow, but it looks like yours is white. I wonder if it's more like our farina, or Cream of Wheat cereal? I always thought my semolina is the same as yours. I'll take a picture of mine in the morning, in daylight, so you can see the proper color. Quick question. Has anyone made these and how did they turn out? Someone on another thread mentioned they did not turn out very well. I checked the recipes and they seem to be correct.. Just wondering what went wrong. Klary, I want to do some of your recipes for the holiday. 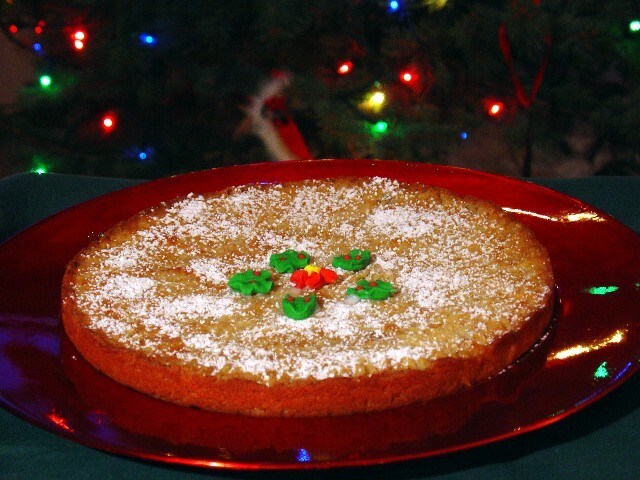 I'm going to make the boterkoeke with ginger for Christmas morning, and I'd like to do the advocaat/bitterkoekjes pudding for Christmas Eve. Can you give me some proportions for the pudding? They both sound perfect for this time of year. Chufi, I have my filling all ready and will be making the gevulde koeken either today or tomorrow. I will let you know how I get on. 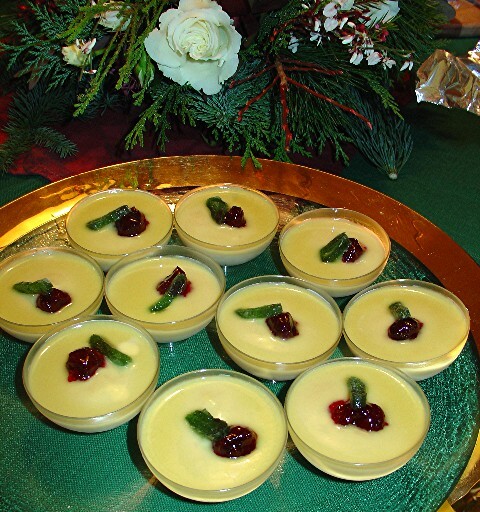 I'd like to do the advocaat/bitterkoekjes pudding for Christmas Eve. Can you give me some proportions for the pudding? They both sound perfect for this time of year. Do you want a pudding that is supposed to set in the fridge and then turned out on a plate, or something more custardlike, like I did in this layered dessert? same ingredients but 40 grams of cornstarch instead of 20. Crumble the cookies into the milk and bring to the boil. Cook until the cookies are dissolved. Cream the egg yolk with the sugar. Mix in the cornflour. Use a bit of the milk to loosen the eggyolk mix, then pour this into the pan. Whisk, bring to the boil and cook for a couple of minutes. For the dessert in the picture, I have to admit I was sort of winging it and the endresult was pretty runny/custardlike. While it looked great in the serving dish, when it was time to serve I found that the layers were all running together. My advocaat was pretty runny too. 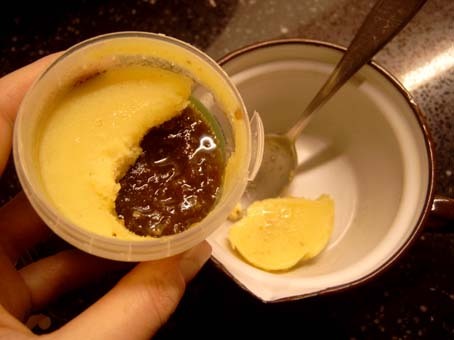 So my suggestion would be that even when you are not making a pudding to turn out, it's best to stick to the proportions for pudding, so you have the contrasting layers of set pudding and liquid advocaat. 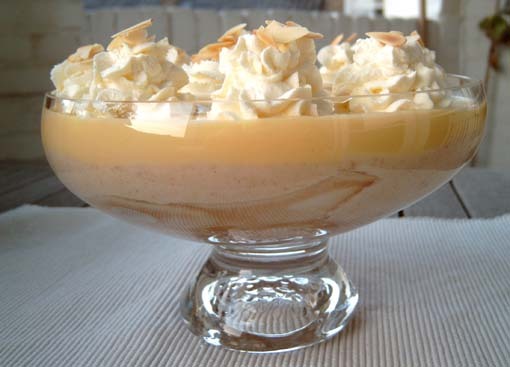 Or you could do a pudding to turn out on a plate, and pour the advocaat on top. 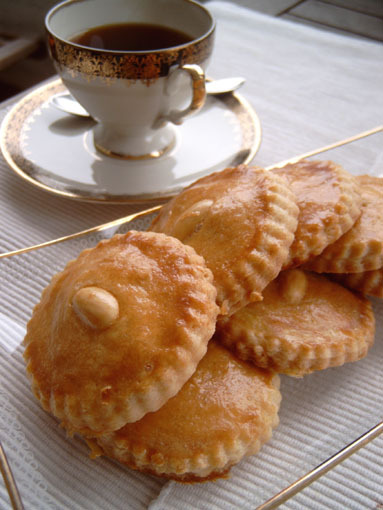 Also, I would add something for texture: some chopped almonds, or decorate with whole bitterkoekjes. Goodluck! Did you already make the advocaat? How did it turn out? My photo is not as artistic as yours, Chufi. These look and taste so much better than the bought ones I've had. The filling was exactly as I remembered my Oma making. The only problem I had was with the oven temperature. I found I needed to turn the oven up to about 170 C and even then they took about an hour to cook. I did a quick search on the net and found suggested temperatures ranged from 160 C to 200 C for this recipe so I felt okay about turning up the heat. I guess it all depends on oven type, fan forced etc. Wonderful, Cadbury! I'm so glad they turned out well! So, based on your experience, I think I will adjust the temp in the Recipe Gullet recipe. Thanks for being a recipe tester! I want to look just like yours, but partly set up would be good, so I'll use the pudding directions. Thanks! I haven't made the advocaat yet. Looking for the equivalents to brandewijn on Google, I see some recipes with cognac, and some with vodka. Therefore, I'm thinking of making it with half vodka, half cognac. Yum, I've been just dying to make this dessert! Stamppot is the quintessential Dutch winter comfort food. It consists of mashed potatoes with some kind of vegetable, cooked or raw, mixed into it. The amount of vegetables is large enough to make this a substantial dish, not just flavoured mash. here's the endive washed, dried and shredded. 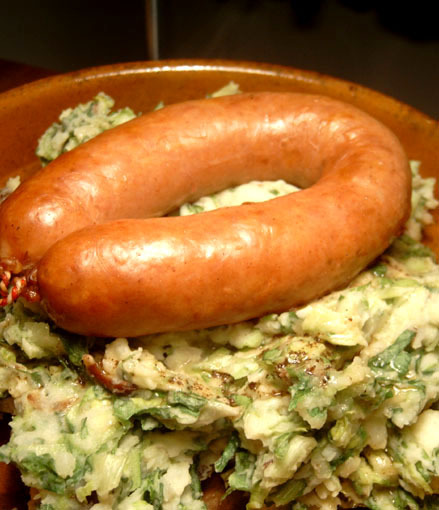 Other ingredients: smoked bacon and the famous Dutch rookworst, smoked sausage. 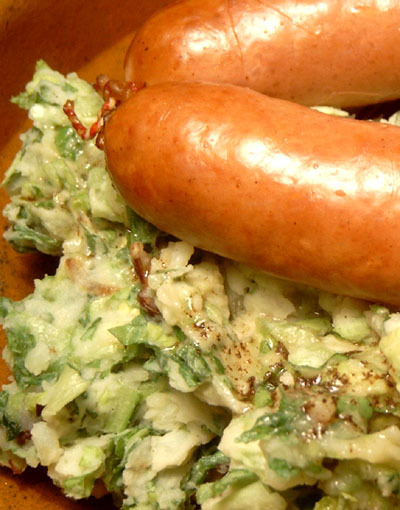 Rookworst is an essential part of many winterdishes - stamppot, but also split pea soup, is just not the same without it. 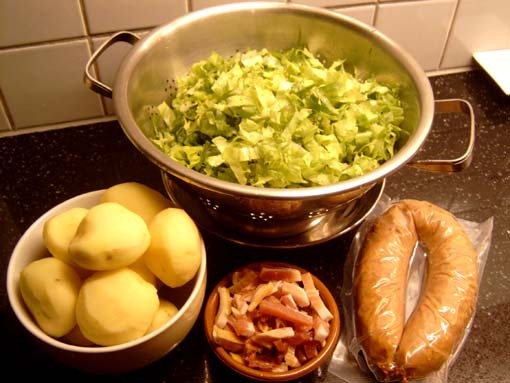 For the stamppot, use about twice the weight of potatoes to endive. Boil the potatoes in salted water until done. In the meantime, render the smoked bacon lardons. When some of the fat has rendered, I like to add a sliced onion to the pan. Not traditional but good! When the potatoes are done, drain them and mash them with a little milk. Add the bacon/onion mixture (together with some of the bacon fat) and mix and mash. The mash does not have to be completely smooth, in fact I like it better when it still has some texture. 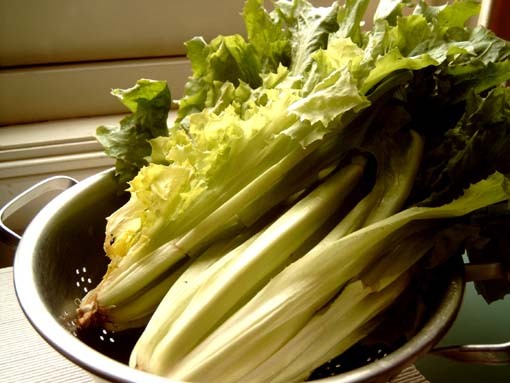 Now put the pan with the mash over a very low flame and add the endive, a handful at the time. Keep stirring until you have mixed in all the greens. The trick is to wilt the greens in the heat of the potatoes, without burning the mash or letting the greens go soggy - they should still have a little crispness. Season with salt, pepper and a little nutmeg. In the mean time heat up your sausage. Finished dish. Serve with the gravy and some sharp mustard. 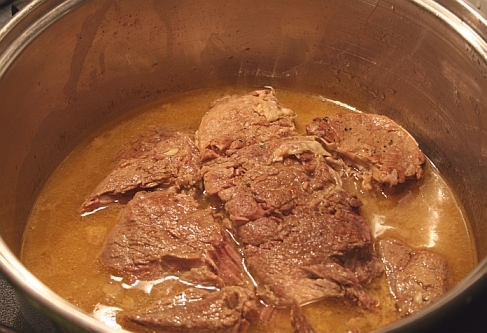 Braised Beef, Dutch Style aka Chufi's Butter-Braised Beef in our house, is simmering on the stove even as we speak. ...Smells good. I know it's not the most photogenic of dishes, but will you please post a pic of it in this thread? Can't wait to see how it turns out! Klary, I haven't been here for a while, but I'm glad you're recovered and in good health. I just noticed the picture of you in your avatar, and you look like you could be a member of my husband's family. They are Frisian Dutch. I'm enjoying all of your recipes and pictures, and I'm going to try some of them when I'm on vacation next week. I wish I had some of that stamppot right now! Here's the boterkoek I baked today. This one's a gift so I couldn't cut it open to see the crumb, and the one I baked for us for Christmas morning is well-wrapped and slumbering in the freezer. I figure I'll let it thaw on the counter overnight on Christmas Eve and warm it a little before serving it with the presents. I used 12 knobs of ginger, since we all love it. It turned out sooooo good. This was some of the best comfort food we've had in a while. It's seldom that I make well-done beef dishes, but I've been wanting this since you first posted it, and I'm so glad I made it. 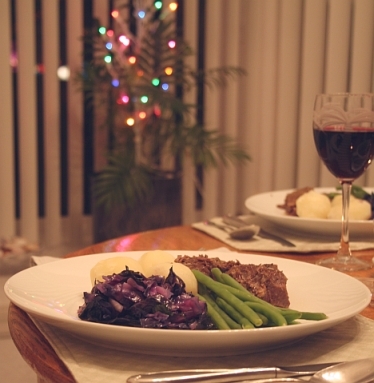 I took your suggestion of classic accompaniments, and served plain boiled potatoes with it and two vegetables, red cabbage and green beans. Thanks Klary for this entire thread, but for us especially thank you for your Butter Braised Beef. They are the main ingredient for what's known as the "kapiteinsmaal", the Captain's Dinner. 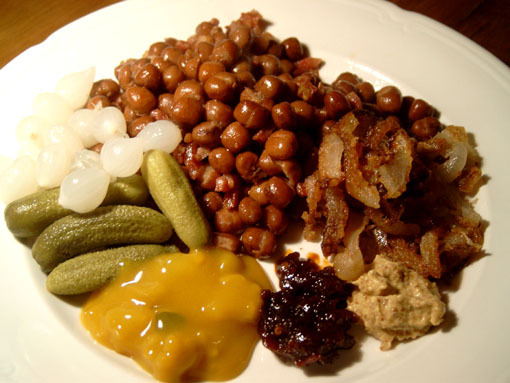 Klary, could you please post up the cooking method/recipe for the capucijner peas with bacon? I didn't see it in RecipeGullet. I found a can of imported capucijner peas today in one of our local grocery chains (Save-On Foods) here in Vancouver. When they are nice and crisp, I remove them from the pan (leaving the fat behind). 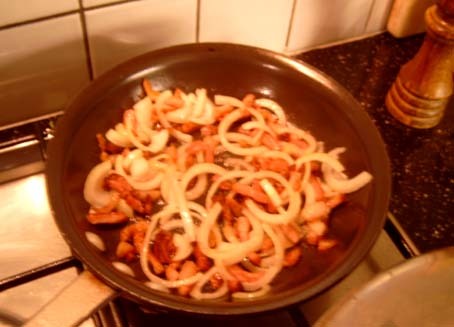 In the baconfat I fry a couple of onions, sliced into rings. When the onions are almost ready (nicely browned and crisp), heat up the capucijner peas. (heat them up in their liquid, don't let it come to the boil). Drain them, add the bacon, and warm through over low heat. Add a little pepper, you probably don't need salt because of the bacon. Good luck and let me know how it turns out! Abra and Susan, how beautiful are those pictures of the Dutch food with the colorful Christmas lights in the background. Abra - the boterkoek looks fantastic. I love that you are giving one away as a present. 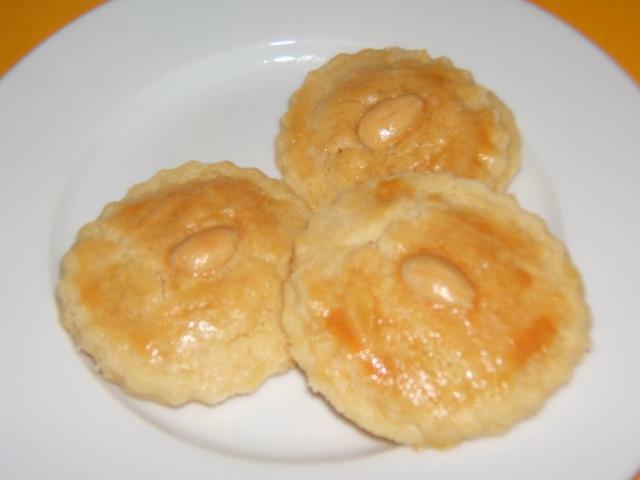 When I was young I would often come home from school to an enticing smell of freshly baked boterkoek. There would be one or two of them cooling on the kitchentable, but I knew better than to look forward to a slice, because they would all be given away as presents.. it was (and still is) my mom's favorite thing to give away. She brought me one only last week when I was sick. Susan, that's picture-perfect draadjesvlees - thready meat! It looks like it's falling apart which is exactly what it should do. I'm glad you liked it! My offerings for nibbling on Christmas day while we unwrap our presents. 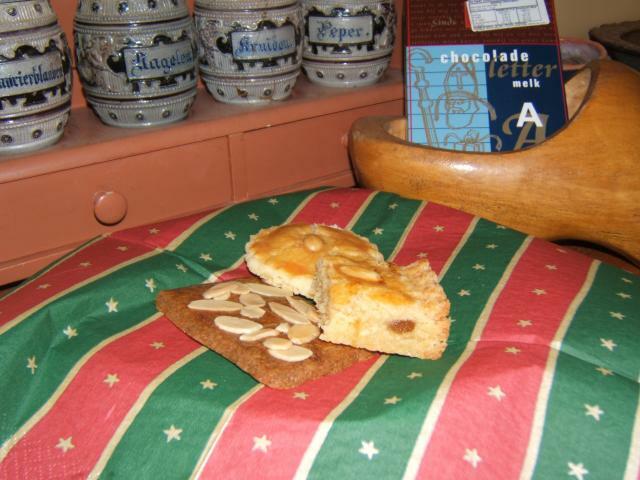 Oma's Gemberkoek, Speculaas and Gevulde Koeken. I've also bought a chocolade letter for each of my daughters and my neice. Dear Cadbury, how absolutely gorgeous to see your beautiful Dutch food on the web. And your Oma, had tears in her eyes when she saw her kruiden potjes on the screen. We are both drooling at the offerings we are expecting for Christmas tomorrow. Love from Lonja (mum) and Mab (Oma). Cadbury, that is gorgeous.. and I love all the Dutch props in your picture.. the cute spice jars, and the wooden shoe!! I gather your Oma is Dutch? did you ever live in Holland or were you born in Australia? I think it's wonderful how you honour your Grandmothers traditions. I wish you and your family a great Christmas! Mum and Oma are Dutch. I haven't been to Holland but hopefully I will go with Mum one day. Last night I made the advocaat for the bitterkoekje pudding. It's a bit dark, but I'm hoping that a little aging will yellow it up. No brandewijn to be found, so I did combine cognac and vodka, but at least I found Dutch vodka - Ketel One is made in Holland, so I got that for a smidgeon of authenticity. I haven't tasted it yet, but it smelled delicious, and was creamy and thick when I put it in the fridge. Last night I made the advocaat for the bitterkoekje pudding. It's a bit dark, but I'm hoping that a little aging will yellow it up. the dark color is probably from the cognac - Dutch brandewijn (like wodka) is colorless. I'm sure it won't matter for the flavor though. Well, we sure sang Klary's praises throughout our Christmas weekend! The boterkoek was scrumptious, and not even that gingery, considering how much I put in. The texture is really interesting - but I noted upthread that someone referred to it as a "cookie." 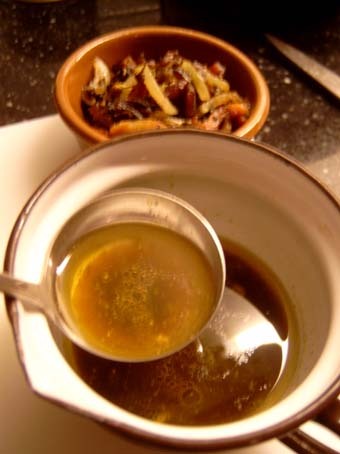 I think that you must use ginger preserved in syrup and not the dried crystallized stuff, or else you will get a cookie! The moisture from the ginger is a big part of the texture. Ours was melt-in-your-mouth buttery and delectable, and definitely a cake not a cookie. You can't really see the layering in these pictures, because I used really tiny bowls. That meant that anyone who wanted to could have three or four of them. We won't mention who would do a thing like that. I did add a bit of almond extract to the puddings, as they weren't as almondy as I'd hoped with just the bitterkoekjes for flavoring. That's a dab of sour cherry preserve, and some candied angelica sent to me by jackal10, on the top. They look beautiful, and very "christmassy"! I am so glad you liked them. And hey, if it's tiny bowls, who cares if someone had more than one?